I'm sure this has been covered before but I'm unable to find a definitive answer. On a blobeye jdm sti (twinscoll 2005) I'm looking for a new donwpipe. Are these 2 item interchangeable? I.e can I remove my stock blobeye one and fit the hawkeye one in place? Many thanks in advance, I'm still new and getting used to the Subaru world! Blob and hawk twin scroll are the same. You'll probably need a map tweak, as that looks like a sports cat. 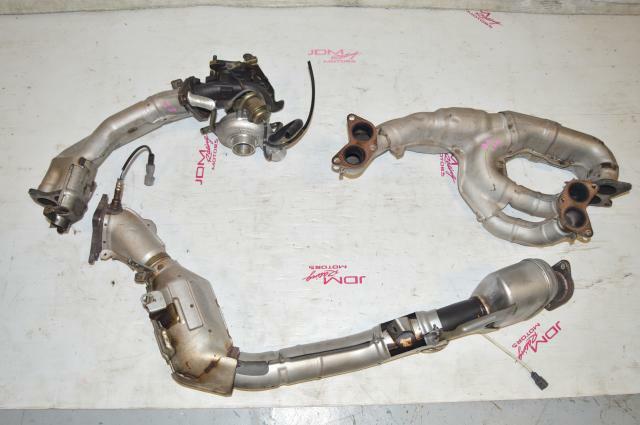 I was under the impression the GDB-C/D Twinscroll JDM STI 03-04 Models (non widetrack blobeye) had different length pipes compared to the GDB-E Twinscroll JDM STI 05 Models (widetrack facelift blobeye)? Interestingly I'm looking in to this very thing myself currently and everything being labelled up as just 'GDB' is very unhelpful. Interested to hear how you get on! ive got a sard sport cat downpipe ceramic coated for sale in couple of weeks. Made there many gains from this over then standard twinscroll downpipe?